Easter Sunday was a light day for political talk shows, but Republican misinformation still found a home on Fox News Sunday. Sen. Jon Kyl continued the Republican effort to misrepresent public opinion of health care reform and repeated the false claim that the stimulus failed to create jobs. Meanwhile, Rep. Kevin McCarthy wrongly claimed that Democrats haven't focused on job creation. CLAIM: Sen. Jon Kyl Falsely Claimed The Recovery Act Had "Very Little Effect." SEN. JON KYL: In terms of stimulus, I think what Republicans will do is look very carefully at any more spending plans because, as it turns out, we have spent hundreds of billions of dollars to very little effect. 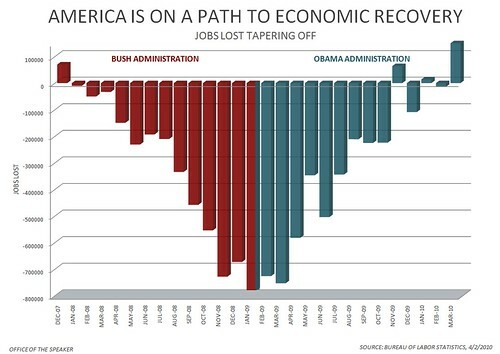 FACT: The Recovery Act has created up to 2.4 million jobs and put America on the road to recovery. CLAIM: Sen. Jon Kyl Wrongly Asserted That "Every Poll" Showed The American People Opposed Health Care Reform. SEN. JON KYL: Every poll showed significant opposition to the health care legislation. By 2 to 1, the American people said stop it from passing. FACT: Polls show the American people closely divided, but most Americans either support the Affordable Care Act or wish it went further. REP. KEVIN MCCARTHY: They shoved down health care without the American people being for it...they continue to not focus on job creation. FACT: In addition to the Recovery Act, which created up to 2.4 million jobs, Congress passed a jobs bill in March.